How many of your clients, from babies to adults, have chronic gut problems? How many people do you see with emotional and mental health challenges, who also have gut problems? Have you seen the new research that provides incredible new insights into the gut and its enteric nervous system (often referred to as the second brain)? There is so much new knowledge to absorb and integrate into a bodywork practice? Nikki Kenward, CST-D has integrated this new information into her clinical practice and has now developed a Wall Chart and Tummy Tracker Journal to help you and your clients absorb and use the new information. The colourful wall chart is a great tool to educate and support client’s progress towards better gut health. 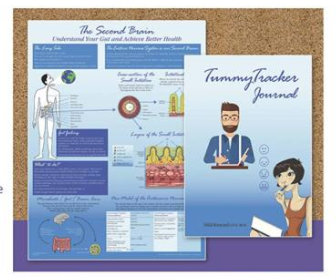 The Tummy Tracker Journal guide clients through journaling their gut’s response to foods, as well as its response to their physical, mental and/or emotional status. By understanding this wall chart and using the journal, clients will likely see patterns emerge and become aware of what is impacting negatively on their gut health. They can being to make changes and see and improvement in their overall heath.